When the Red Army Ensemble visited Britain in 1956 Stalin had been dead just three years, the Suez crisis was about to break and glasnost was nothing but a pipedream. Yet their sell-out concerts marked something of a thaw in frosty post-war relations, with the 200-strong ensemble making a return visit in 1963. Only the political fall-out following the ‘Prague Spring’ prevented a further tour in 1968. EMI were shrewd enough to tempt the Russians into the recording studio on their first visit. Such was the success of these recordings – not least in terms of profits – that EMI’s Walter Legge booked them for another session during their 1963 tour, when the remaining items were captured on tape. The only track not previously released is the last, God Save the Queen. In the deeply cynical post-Communist era it may be hard to understand why this band appealed to British audiences but this newly remastered collection may go some way towards answering that question. First there is the unique, vibrant sound and, second, the choice of repertoire; Russian ‘lollipops’ with some English songs thrown in as ice-breakers. Couple that with mostly vivid sound and you have 77 minutes of pure, undiluted nostalgia. The helter-skelter Song of Youth gets the disc off to a hair-raising start. There is an amazing ebullience, a real sense of collective enjoyment, that permeates this collection. The soloists also sing with great ardour and feeling, notably I. Didenko in A birch tree in a field did stand and several of the more memorable songs on this disc. Soldiers and soldiering are never forgotten, though. In Far Away a frontier guard dreams of his beloved; there is a naïve charm to the music, with its echoes of Tchaikovsky, and even though the overt sentimentality might induce a snigger or two in 2007 it is still a strangely moving piece. That lone tenor rising from the chorus at the close will surely soften the hardest of hearts. You are always beautiful is rather more extrovert, the balalaikas contributing to the song’s distinctively Russian flavour. The tenor Evgeny Balaiaev sings well, especially in the quieter moments. He may lack Didenko’s fuller, more burnished tone but he does manage a thrilling top note at the end. He is also wonderfully heroic in Kalinka. Another soloist, the bass Aleksei Sergeiev, takes us on an atmospheric troika ride On Peter’s Street. Such is the warmth and vitality of the singing that one can hardly fail to respond to the music’s simple charms, just as those audiences probably did 50 years ago. And the sound of the Ukranian zither or bandura also brings a warming glow to the soldier’s memories of his beloved in Bandura. V. Federov’s stygian bass is a marvel here, even though he only has a minor role to play. Given this ensemble’s provenance it would be surprising if there weren’t at least one Communist-era crowd pleaser, and The Soldiers’ Chorus is it. Taken from Shaporin’s opera The Decembrists it celebrates the early revolutionaries who rose up against the Tsar in 1825. Eminently forgettable, but at least it’s the only tub-thumper on the disc. The next three items were recorded in 1963, and it shows in terms of general presence and refinement. Balaiaev makes a welcome return in Beautiful Moonlit Night, urging his loved one to come across the frozen fields and warm herself against him. It is not particularly memorable, though the tenor pulls off some sustained high notes. In Kamarinskaya the chorus and singers take a rest and the balalaika and orchestra take over for a rattling good instrumental break. But the real change comes with Annie Laurie, the first of the English songs on this disc. Balaiaev literally rises to the occasion, singing above a murmured chorus. It must have been a real showstopper all those years ago; there probably wasn’t a dry eye in the house. With Black Eyebrows we are back to the older acoustic; the sound seems much more boxy than before, although the soundstage improves marginally in Ukrainian Song. Aleksei Sergeiev’s bass – and the overripe brass – are well caught, though it has to be said the orchestra and chorus sound a little fierce in the tuttis. The bass Artur Eizen sings Oh no, John! in deliciously accented English. Fortunately the somewhat restricted sound can’t disguise the colour and humour in his voice. Nearly three-quarters of the way through the disc and there is a sneaking suspicion that we may have heard all the best bits before the interval, so to speak. Song of the Plains and Snowflakes are not very memorable. Even Didenko – his ringing high notes notwithstanding – lacks that old magic. At least the rousing Song of the Volga Boatmen injects some much-needed brio into the programme, as do the two tenors in the rather jolly Nut-brown Maiden. The boy gets his girl there, but in The Little Bells he can only dream of her. This is the kind of sentimental music this ensemble does so well, the tenor singing ardently above a thrilling but muted chorus. Nikolay Abramov’s high tenor is just spine tingling. The last part of the disc begins with the ‘protest song’ If I had a hammer. The baritone begins it in Russian but ends it in English. The odd thing is they make it sound like a spiritual; it may sound a tad awkward but full marks for giving it a go. It feels like we’re moving into encore time with the Great War tune It’s a long way to Tipperary – which gets a marvellous outing, again in delightfully accented English – and their rendition of God Save the Queen, which sounds splendid, if a little stilted. Hats off to EMI for issuing this most entertaining collection. Even if this music isn’t your usual fare there are bound to be some tracks that appeal. Certainly the first half of the programme seems to have the best bits and all in pretty good (stereo) sound, but the evening does start to drag a little after that. No texts or translations included; still, there are brief synopses on each track so you can get the gist of what’s going on. 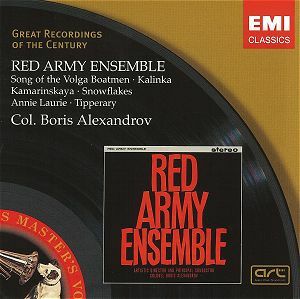 This is a fascinating disc recreating an era when the Red Army musical ensembles had a real glamour and exoticism in the West. Barriers were falling – sometimes only temporarily – and Soviet artists including Oistrakh, Mravinsky and Kondrashin were beginning to be heard ‘in the flesh’ by Western audiences. The highlights: This two hundred strong male voice choir perform at breathtaking collision crash speed Dunayevsky's Song of Youth. The solo tenor (I. Didenko) is set against the quiet then loud singing of the choir amid a spangle of balalaika in the traditional A birch tree in a field did stand; a melody used by Balakirev and Tchaikovsky. In Georgi Nosov's Far Away the solo tenor is the ringingly Puccinian Evgeny Belaiev. The Nosov is more of a sentimental troubadour serenade with woodwind and balalaika in discreet supporting roles. Boris Mokrousov's You are always beautiful steps out at a brisk tempo testing the breath control of soloist Belaiev. Kalinka was pretty much a trademark song for the Red Army Ensemble with its glitter and steady accelerando here added to by bird songs. The traditional Along Peter's Street has a fine bass in Aleksei Sergeiev and nicely conveys that feeling of a sedate troika ride. Bandura is Ukrainian in origin and is sung in that language with the excellent I. Savchuk as tenor and V. Fedorov as bass. Shaporin is one of my special interests so it is good to hear the Soldier's Chorus from the opera The Decembrists – see Preiser recording. This is typical Red Army fare: an oompah underpinning and a sturdy march with a soldierly swing rising from whisper to blaze. There’s an almost Coatesian sense of elation too set off by a filigree of piccolo and flute bird against a light haze of balalaika. If there’s a touch of Verdi's Dies Irae it’s none the worse for that. Beautiful moonlit night again features Belaiev amid a tremolo of balalaikas - romantic winter nights indeed. Sentimentality is part and parcel of this collection as you can also hear a capella in the hushed Little Bells. That romanticism is accentuated by the pervasive presence of the balalaika on many of the tracks. The traditional Kamarinskaya is the first and only purely instrumental track - mostly for the balalaikas but with brass interjections. It rises from gentle musing to an exuberant stomp. Belaiev tackles the challenge of English for Annie Laurie and achieves a nice effect even if he seems fractured and disengaged from the meaning of the words. The very famous Arthur Eisen makes a much better job of Ah No John. Eisen proves a real asset with his totally secure bass and his hushed and tense ability to chart a crescendo from whisper to loud climax and then decrescendo. Other English language tracks include Pete Seeger’s If I Had A Hammer in which the voice of bass Aleksei Sergeiev rings out in Paul Robeson fashion. No doubt the politics of both Seeger and Robeson helped here. There is surely some irony and a little ingratiation in the inclusion of God Save The Queen – complete with balalaikas – and It’s a long way to Tipperary, the latter ringingly sung with a crash and a tramp. The traditional Ukrainian Black Eyebrows is essayed by I. Savchuk recorded more distantly than in the other tracks. It’s passionate but not really very interesting. We stay in the Ukraine for the much more interesting Ukrainian Poem by A.V. Alexandrov. There's a longish enchanting orchestral prelude before the bass Sergeiev soulfully enters with some dramatic singing. This is the longest track here and has about it the air of Egmont – epic-heroic. Lev Knipper wrote plenty of symphonies very few of which have been recorded - only No. 4? His ‘hit’ is Song of the Plains. This evokes steppe cavalry charging from the distance and then right up to the listener and then you streaming on either side. Allowing for the coconut shells for horse hooves and the recurrence of a bird whistle this is all quite effective as you are swept up into the saddle and then gently set down as the riders sweep into the distance. A novelty GROC heavy with 1950s and 1960s nostalgia. Testimony to the lively imaginative acumen of the EMI Classics team.